In collaboration with Stathis C. Stiros from Patras University and The Institute for the Study and Monitoring of the Santorini Volcano (I.S.M.O.SA.V.) 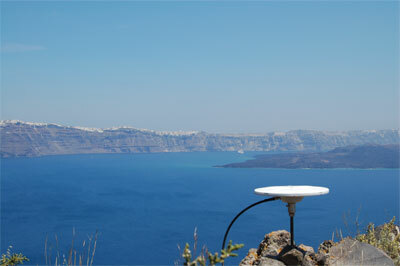 three permanent GPS stations were installed along the Santorini Caldera on the islands of Thira and Thirasia. Station KERA is located on the south-east side of Thirasia. It is a DC power station with a radio modem link to a DSL modem located at the convention center in Fira on the island of Thira. Station NOMI is located on the roof of the same convention center and is directly connected to the same DSL router. The third station only had its infrastructure installed which consists of an enclosure, DC power system and a radio modem link to the convention center. In addition to the permanent sites over 15 campaign sites were installed and occupied.